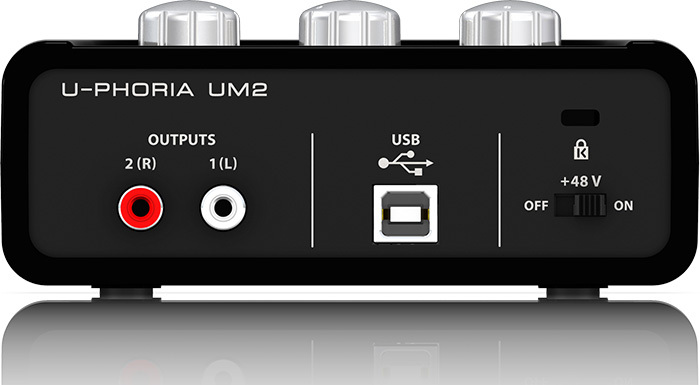 Company Behringer released new USB audio interface of entry-level U-PHORIA UM2 with 48 kHz sampling rate, 100 dB dynamic range and 1XENYX preamplifier. Manufacturer does not tell with which precision device works, but the most probably with 24 bits; on frontal panel of device there are : combined XLR/TRS 1/4″ jack microphone/linear input and TRS 1/4″ jack instrumental Hi-Z input with signal and clip indicators, Direct Monitor function switch, power and phantom power +48 V indicators, as well as TRS 1/4″ jack monitor headphones output. On back panel of deice there are : 2 RCA linear outputs ( left and right ), USB port for powering and connection to computer, phantom power +48 V switch and Kensington Lock slot; on top panel of audio interface there are placed microphone/linear and instrumental inputs gain and linear outputs volume control knobs. Behringer U-PHORIA UM2 draws only 2.5 W of energy and works in Mac OS X without additional drivers with Core Audio interface support; in Windows XP, Vista, 7, 8, 8.1 and 10 it works through ASIO 4 All driver; in both OSes device interacts with modern DAWs : FL Studio, Cackewalk Sonar, REAPER, Avid Pro Tools, Ableton Live, Steinberg Cubase and others, All analogue inputs and outputs of device are unbalanced. 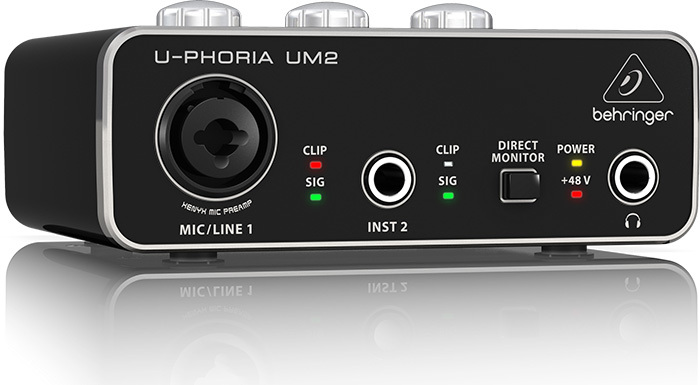 With Behringer U-PHORIA UM2 DAW Tracktion is supplied, after its purchase from manufacturer’s website there is ability to download different VST/AU instruments and effects and various other applications. 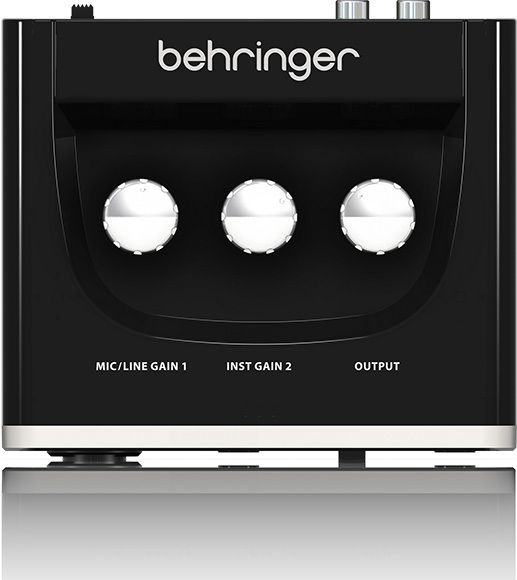 Device’s body is made from aluminum, its sizes are 46.45 ( height ) x 128 ( depth ) x 118 ( width ) mm and mass is 300 g.
Package with Behringer U-PHORIA UM2 contains : USB cable, 3-year warranty card and user’s guide. Audio interface is good as compact sounds recording device with low power consumption and it can be viewed for purchase, when these qualities are imperative and mono-signal recording is enough; probably, its price will also be not high. But there are compact devices with better characteristics, for example, ESI UGM96, as well as others. If compactness and low power consumption are not so important, then there is ability to find USB audio interface of entry, middle and top level with much better characteristics of Steinberg, Behringer, Focusrite, Roland, ESI, M-Audio, Alesis and other companies production.